The Truck Stop app with the longest running data system behind it. We are first with almost every new innovation and idea in the driver space and then others try and copy us. So we keep on innovating to stay the best. See the most common help/questions here at the F.A.Q. or email apps<AT>allstays.com and you will get help. The ultimate app for truck drivers. 100% Made in the USA, this is the only ad free, tablet ready truck stop app that is updated with driver comments. Where are the closest truck stops like Flying Js? Who has bulk DEF? Where is the next service or tank cleaning? How about a southbound Rest area or weigh station? 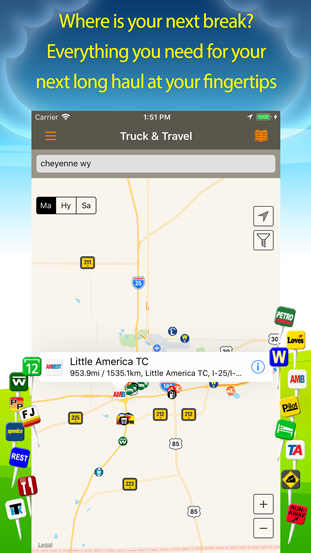 Providing online truck stop information since 2003, this universal iOS trucker app is updated often with user input from both the app, websites and other brand partnerships. Truck & Travel checks your location and displays all points on a map view. You can filter by type to see only what you want to see on the map and zoom out. You can also use the offline manual lookup to find locations by type, state and city...even when you do not have service! Truck & Travel puts all kinds of data at your fingertips. This is currently over 35,000 points. ✔Turn outs and rest areas broken down by heading. ✔Resources for each state on highway conditions, emergency phone numbers, road access rules, rest area parking and gun carry laws and much more. ✔4,000 chain motels that ADVERTISE truck parking. There are more out there but these openly want your business. + Search for specific locations around you on a map or even satellite view. + The map automatically loads points as you scroll. + Multiple types of icons to help spot things on the map. + Advanced filters: Only want a certain brand with parking, showers, ATM, Bulk DEF and a Wendys? Filter for it! + One-touch calling for places that have a phone number listed. In this economy, good idea to call ahead on important stuff. + One-touch turn-by-turn directions for all POIs. + Works when iPhone has no phone service. + Supports a manual lookup mode where users can look up locations by state and city. + Help system with tips and frequently asked questions. Truck & Travel is constantly being updated with more features and data points. "Hands down the greatest truck driver resource available now. Seems like they thought of everything but it keeps getting better every month." ➤As seen in "Harvard Business Review"
- Rest area rebuild. Now see directional access at a glance right on the map. - Fixed a bug that caused a few hundred rest areas not to show, especially impacting Canada. - Steep road grades for CA, UT, OR, WA, MT and ID. - Enlarged and better icons for AM Best, Flying J, Loves, Petro, Pilot and TA. - Ratings! Add your truck stop reviews. - Star rating average based on the last few years of user ratings. -Data expansions and more user comments. Multiple things happened (map fee increase, a app ban/removal and censor of core data) that led to a departure from Android in late 2017. Full data is still on Apple and allstays.com as normal. The Android apps will keep running and anything that goes to the web (website links, images, reviews, etc) will still work and be updated. But major code updates, data adds and deletions will not happen. You can still reinstall on devices as below. Tap Menu Menu and then My Apps & games and then Library. Tap the app you want to install or turn on. Because of the unexpected change, I can do a $10 credit on Pro. If you want to try AllStays Pro, the web browser version that runs on computers and mobiles and has a lot more updated information than the app had, send a email from inside the app or your Play receipt, with "Android to Pro" at the top of text, to apps at allstays.com. Frequently Asked Questions are RIGHT HERE on this link. We also post some of them on our AllStays Facebook page for discussion.